Wigan’s play-off ambitions received a setback when they went down 1-0 to a late Adam Clayton strike at the John Smith’s Stadium. In exceptionally windy conditions both teams struggled to play their best football and the match looked to be heading for a draw with only five minutes remaining when Clayton unleashed a dipping drive from 20 yards which found the bottom left hand corner of the Wigan net. Wigan drop a place to 11th in the Championship table and Huddersfield move up to 13th. Uwe Rösler made four changes from the victory against Charlton Athletic, with loanee Martyn Waghorn making his debut and last week’s goal scorers Fortune and Jordi Gomez coming in alongside Stephen Crainey. Wigan started brightly and looked the more comfortable team in the opening period. Jean Beausejour created a great opportunity to open the scoring when he produced an incisive cross with James McArthur and Waghorn waiting in the area, but neither player could make full contact and the ball was turned behind by Alex Smithies. Waghorn was involved in many of Latics best moves and he should have given them the lead just before half time but his close range effort was directed straight at Smithies. Wigan started the second period in similar fashion and would have been ahead apart from some wayward finishing. Waghorn hit the side netting, James Perch then headed over at close range from a corner, Ben Watson had a shot blocked and then Waghorn first time volley at the back post, hit the side netting for a second time. Fortune got in on the act on the hour mark when his deflected shot hit the cross-bar, but the best chance fell to Waghorn and McArthur who couldn’t finish a perfect cross from Gomez. Latics failure to score was to prove very costly as the Terriers gradually hauled themselves back into the game. 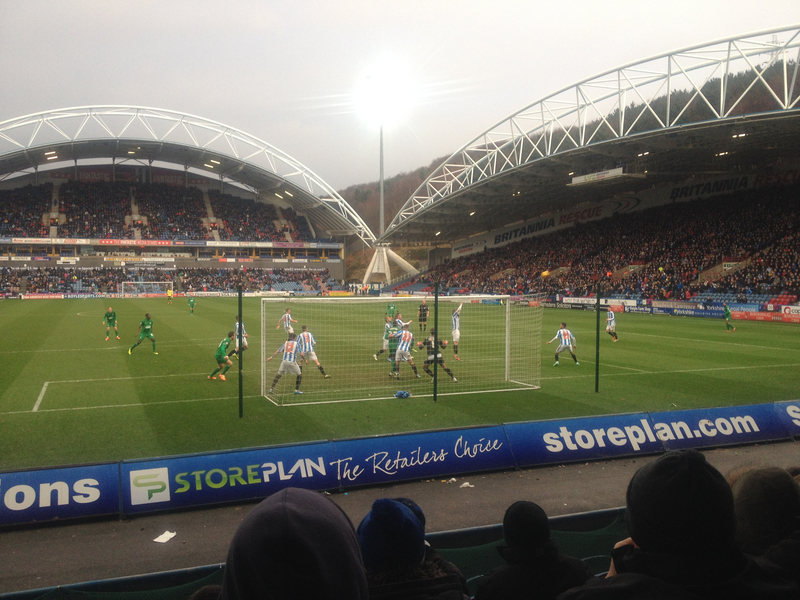 The Terriers brought on midfielder Danny Ward for record signing Nahki Wells and the substitution turned the match in their favour. Ward soon hit the side-netting with a near-post shot from Oliver Norwood’s angled pass and then Norwood himself was soon peppering the Wigan goal with long-range shots. Norwood looked to have given the home team the lead on 80 minutes when his thirty-five yard free kick beat Al Habsi, but the ball came back off the cross-bar into the keeper’s grateful hands. Just when it looked as though Wigan had survived the onslaught, Clayton picked up a poor clearance out of defence and rifled a dipping shot from outside the box into the bottom left hand corner of Al Habsi’s goal. “We played some very good football in difficult conditions and limited Huddersfield to few opportunities, particularly in the second half. “Our shape was good and I was delighted with the way in which we attacked the opposition but when you don’t score from those moments the other side always have a chance. “Their goal came from a clearance we couldn’t make, and was helped by the wind behind it. It is true that Wigan played well in patches despite the difficult conditions, but their lack of a cutting edge in front of goal proved crucial. Latics had 11 shots during the game but significantly only one was on target and it is evident that they are missing injured top scorer Nick Powell. Latics will be looking to get back on track when they travel to in-form Sheffield Wednesday on Tuesday night and then face Cardiff City in the FA Cup next Saturday. This entry was posted in Adam Clayton, Championship, Huddersfield Town, Wigan Athletic and tagged Adam Clayton, Championship, Huddersfield Town, Wigan Athletic. Bookmark the permalink.